This Fully Furnished house is waiting for you to move in. It has everything you need calling a home. 3 Bd/2 Bth Single Story House with saltwater heating pool and a huge back yard. The 50s style living area is vibrant and welcoming. The individually decorated 3 bedrooms have their own charming ambiance. The kitchen is fully equipped. Modern washer and dryer are located in a separate laundry area on the property. Enjoy the fabulous private backyard under the covered patio or on one of the comfortable chaise lounge chairs while eating fruit from the orange or grapefruit tree. Dip into the private pool surrounded by breathtaking views of the Palm Springs mountains and 13 beautiful palm trees on the property. The pool is a saltwater pool and heating is available. 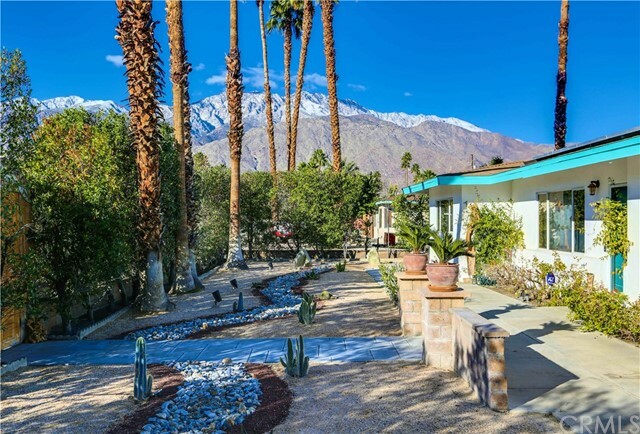 You will love Palm Springs and this home can be your private desert oasis. Two blocks away to a large park, 5-minute walking distance to one of the best golf courses in the area, and 10-minute driving distance to downtown Palm Spring. Ready to Move in now. Rent includes weekly pool maintenance and gardener.